SKU: N/A. 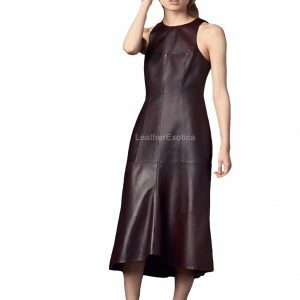 Categories: Best Seller, Leather Coats, Special Categories. Designer style of this women leather coat is beautifully crafted from soft suede leather. This is long length suede leather coat and it has side pockets. This suede leather coat also has long sleeves and classy faux fur collar which will make this coat more stylish. This suede leather coat is faux fur lined which will give you soft and comfortable feeling when you wear it. This suede leather coat also has waist knotted belt with belted loops. This winter season make your look more stylish and attractive with this designer style suede leather coat. This women suede leather coat is available in all size and all colors.